Petrokefali. Petrokefali is a typical southern Cretan village. It is located about three kilometres from Phaistos and eight kilometres from the town of Mires. It is located in the Messara plain, a fertile area with many olive groves and grapevines. In the village live about seven hundred inhabitants who are mostly farmers. In the 1950’s and 1960’s, they also cultivated tobacco and rice. In the area is a lot of water, whenever they drill into the ground there is a water gush. In the village square is the great church of Petrokefali, it is a cosy square with a number of cafes and tavernas. Petrokefali entered the history books in 1583, when there lived about a hundred people in the village. Since then, the village has always been inhabited. Petrokefali literally means “stone head”. According to tradition, the village was named like this because at the top (= head) of a rock was built the first house. Others claim that the village was given the name of a certain resident named Petros who was very helpful and welcoming. Just outside Petrokefali at Aghia Marina there is a donkey sanctuary where old donkeys are cared for. You can visit the farm and see how the elderly donkeys are taken care of and enjoy a nice deserved retirement. In summer the farm ís closed between 13:00 and 17:00 hours. 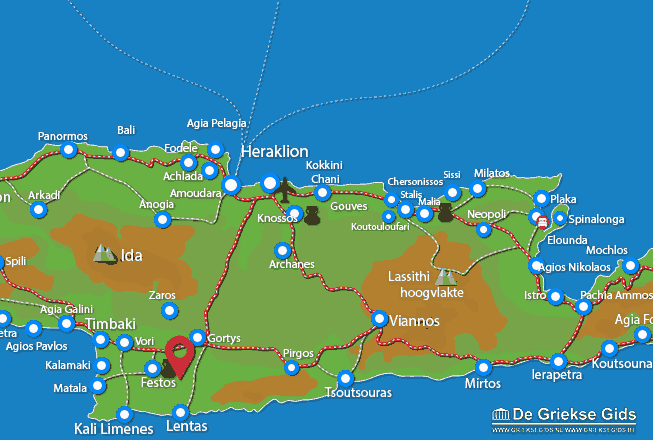 Heraklion Prefecture: Where on the map is Petrokefali located?